Carmesh - ZYLIA PORTABLE RECORDING STUDIO. MULTI-TRACK MUSIC RECORDING WITH ONE MIC. 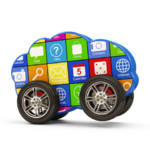 The Carmesh vision is one in which there is seamless integration of the digital life into the automotive context. This is realized by an advanced service delivery architecture focused on the mobile and integrated with disparate wireless network interfaces. The Carmesh vision is one in which the car provides a HTML5 based user interface with typical automotive controls, applications run on the phone and connect wirelessly to the car and these applications are designed with driver distraction in mind.